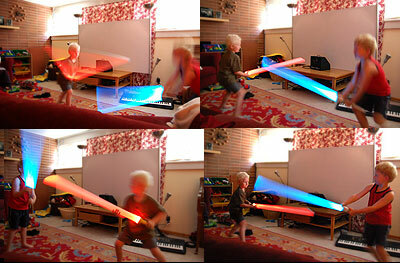 Whip up an impromptu set of lightsabers and have your little Jedi’s learning the way of the Force in minutes. We made up this set of dueling sabers with some garbage and literally about 2 minutes of work. The tubes that we used are the cores that are left over when the plotter at work runs out of paper. If you don’t use large rolls of plotter paper yourself, try hitting up your local Kinko’s, they probably throw these away every day. Remove the red and blue filters from the 3D glasses, and tape one filter over the light-emitting end of each flashlight. Insert the flashlights into the tubes and secure with several tight windings of tape. Cap the other end of the tubes with a reflective cap of shiny material, with the shiny side facing inward (I used some scrap mylar duct insulation, taped over the end). This will illuminate the far end of the tube. This entry was posted on Saturday, September 15th, 2007 at 7:51 pm	and is filed under Easy Projects. You can follow any responses to this entry through the RSS 2.0 feed. Both comments and pings are currently closed. 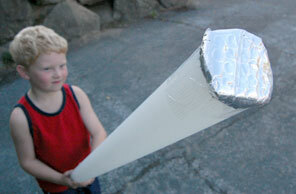 “Golf Club Protector Tubes” work well for this and only cost a buck or so. That is so awesome. I am making a set for my boys this weekend. photos of bugs are great – the tortise is awesome! out of liter bottles?? thanks!! I found that I could use a single tube rather than the composite tube shown in the plans. I think that European pipes are a lightly different size than US pipes. BTW, that is not me in the kilt, but yes, Frank does have some nice tatoos, my favorite is one on his forearm that says HUMAN in a sort of red, U.S.D.A Meat font. Now that’s a great idea, I am looking after two of the grand kids tomorrow, that would cool. Hold on, I can see grandma killing grandpa because the kids light sabered everything in the living room! Hey Jack, where can I pick up some of those Golf Club Protector Tubes? NICE! did you think of this,i would realy love to have one ,but about the 3-d glasses. does gel paper work? This is nothing new or innovative at all. 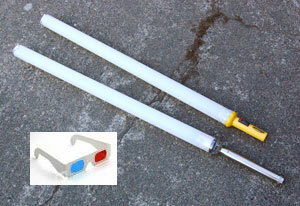 Right after Star Wars came out in ’77, every 5 and dime discount store in America had their lightsaber knockoffs, which were just a cheap flashlight, a color filter, and a plastic tube. yea!! finally i can built a light saber and my dream will became true!! i can conquer the universe!! ahah!! ok.. i’ve finished.. i joke.. thank you very much.. really..
i made one from paper and metal and i made one from lasers cool!!!!!!!!!!!!!!!!!!!!!!!!!!!!!!!!!!!!!!!!!!!!!!!!!!!!!!!!!!!!!!!!!!!!!!!!!!!!!!!!!!!!!!!!!!!!!!!!!!!!!!!!!!!!!!!!!!!!!!!!!!!!!!!!!!!!!!!!!!!!!!!!!!!!!!!!!!!!!!!!!!!!!!!!!!!!!!!!!!!!!!!!!!!!!!!!!!!!!!!!!!!!!!!!!!!!!!!!!!!!!!!!!!!!!!!!!!!!!!!!!!!!!!!!!!!!!!!!!!!!!!!!!!!!!!!!!!!!!!!!!!!!!!!!!!!!!!!!!!!!!!!!!!!!!!!!!!!!!!!!!!!!!!!!!!!!!!!!!!!!!!!!!!!!!!!!!!!!!!!!!!!!!!!!!!!!!!!!!!!!!!!!!!!!!!!!!!!!!!!!!!!!!!!!!!!!!!!!!!!!!!!!!!!!!!!!!!!!!!!!!!!!!!!!!aaa!!!!!!!!!!!!!!!!!!!!!!!!!!!!!!!!!!!!!!!!!!!!!!!!!!!!!!!!!!!!!!!!!! awesome!! 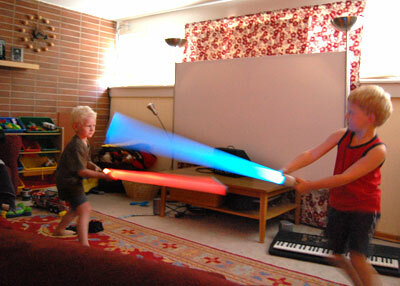 i finally found a real way to do it btw is it possible to make a lightsaber without tubes? great work on the instructions they were very clear. thank u so much!!!! !